Tall floor vases make a dramatic and creative design statement in any home--you just have to find the right spot. Adding dried flowers to the vases allows for an even wider array of decorating options. When you use tall vases, apply the basic design principles you would for any floral arrangement-- balance (either symmetrical or asymmetrical), shape, size, color and proportion. Also consider the formal or informal look of your vase and flowers. Decide where you will place the vase. When you choose a site for the vase, keep your mind open to all possibilities, such as front porches, entryways, room corners or along side a piece of furniture. You will need to arrange the flowers in place, because moving a tall vase with dried flowers already in it would put both the vase and the flowers at risk of breaking. Place the vase where it won't be bumped by people passing by. Add 2 or 3 inches of sand or small pebbles if necessary to stabilize the vase and ensure that it won’t tip over. Consider traffic patterns in your home to minimize the risks of people or pets bumping into the floor vase. Choose the flowers with care. Your display could be based on a seasonal theme, with sunflowers in the summer or rose hips in the fall, or it could coordinate with your room colors. Decide on a color arrangement if you have flowers in multiple colors. Choose a multi-colored and random arrangement, an alternating color arrangement or a single color plan. Hold up stems of flowers to measure them against the height of the vase. Roughly speaking, stems should be proportionately twice as tall as the vase. Clip the flowers as needed. Place an appropriately sized jar or bowl upside down inside the vase if you need to achieve the appropriate height balance of flowers to vase. Place one or two thick stems with leaves, grasses or branches into the vase first. Place larger dried flowers into the vase next. Add the smallest flowers with the thinnest stems to the vase last. 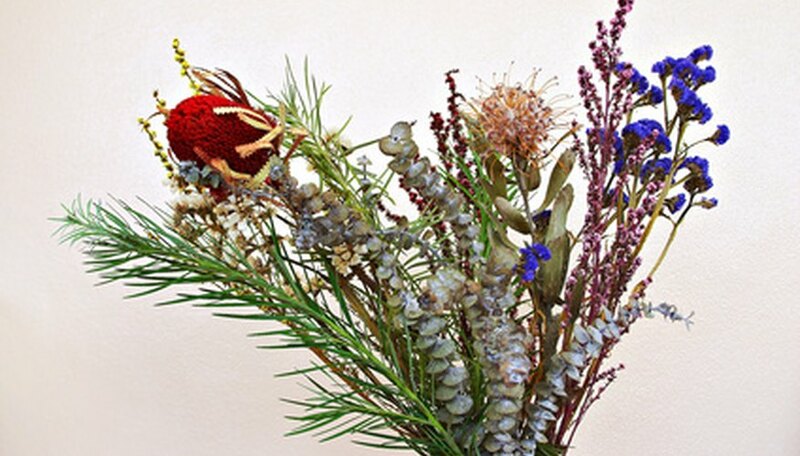 Add additional grasses, leaves or branches to fill out the bouquet if needed. If you plan to dry flowers yourself, choose those that dry well. Good choices for large flowers include camellias, dahlias, hydrangeas, lilacs, peonies, roses or sunflowers. Smaller flower stems suitable for drying include baby's breath, bachelor's button, larkspur, lavender, Queen Anne 's lace, sage, statice, strawflower or yarrow. Flowers such as sunflowers or hydrangeas and mixed colors have a more informal feel while stems of one color and flowers such as lilies have a more formal tone. Add non-floral items to your arrangements for seasonal appeal, such as sparkling lights and red berries in December; hanging decorated eggs at Easter or red, white and blue flags for the 4th of July.